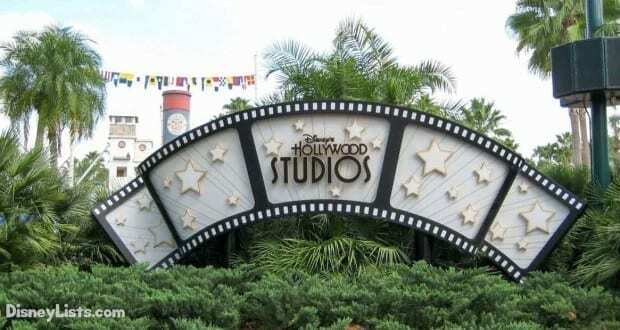 Hollywood Studios – where “Lights, CAMERA, Action!” take center stage! Let’s feel like a Star on the red carpet and get the most out of taking photos at this action-packed park. Here are a few tips and tricks for taking photos at Hollywood Studios that maybe you’ve never thought of before! All right superstar, while we highly recommend stopping at all the PhotoPass spots – Hollywood Studios is the perfect place to stock up on some exceptional selfies. We personally aren’t huge selfie fans (something about seeing our big heads on social media! ), but when we can snap a selfie posing next to an image of Walt Disney while walking through the One Man’s Dream attraction, we say why not have fun with it! 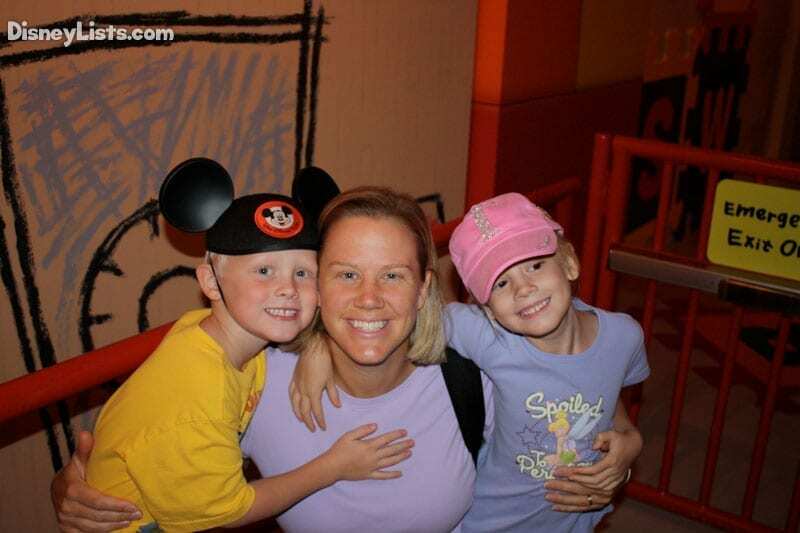 Also, be sure to check out our best photo spots in Hollywood Studios for more great picture ideas. Once again, PhotoPass spots are excellent, but we’ve noticed that some of our favorite family photos are the impromptu ones. For example, we have a family photo of everyone sitting on the bleacher seats getting ready to watch Beauty and the Beast Live on Stage. Some are snacking, some are talking – but it’s photos like these that capture the real family moments spent together. Even the planned family photo of everyone smiling while waiting in line for Toy Story Midway Mania amidst the massive toys are memorable photos. This can be a fun scavenger hunt for the kids! Throughout the park, we’ve found different items that make for fun props to pose next to. The most common one would have to be in front of Star Tours with the Speeder Bike. You can also head over towards Toy Story Midway Mania and pretend like you are trying to pick up the barrel of monkeys! Point up while standing under the upside-down car as you enter the Rock “N” Roller Coaster area. Plus, don’t forget that Cast Members can be unique props – especially the serious and kind of creepy ones at Twilight Zone Tower of Terror! The time of day plays a huge roll in how a picture looks. Snap that family photo first thing when everyone is fresh, but don’t forget to capture another photo even in the same spot if you’d like, when evening sets in. It’s amazing to watch the transformation of the lighting as the night crawls in. Since we mentioned the Tower of Terror above, this is an especially awesome area to take a few photos at night. Go see all your favorite characters at Hollywood Studios and do the usual photo posing for sure. We recommend however taking it one step further and embracing the character for what they might be most known for. Snap a selfie with the sweet Chewbacca, high five Jake from the Neverland Pirates, salute with an Army Solider, be serious with a Storm Trooper, pose on the red carpet with Minnie, look bewildered while trading with a Jawa, and make it look like you are jumping on the bed with Woody and Buzz. Get creative and have fun with it! 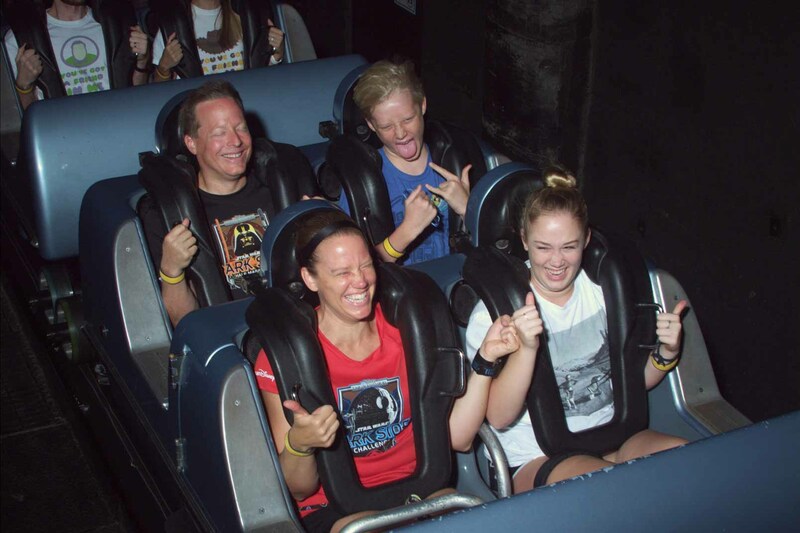 Hollywood Studios has two attractions that have ride photos – Rock ‘N’ Roller Coaster and Twilight Zone Tower of Terror. If you know when these photos are being taken, you and your party can have some fun with the photo. Rock ‘N’ Roller Coaster snaps a photo the moment you are shot from 0 to 60mph at the very beginning. Good luck holding a smile in that moment! Tower of Terror will capture one of your first drops, usually when the doors open and you can see the outside. Maybe for that moment you can put your arms up in the air?! Better yet, don’t tell anyone in your party that photos are taken or where they are at and you’ll have a priceless memory of their horrified face to keep forever! What better way to remember that delicious meal or snack than to take a picture of it! We never used to do this, but we’ve learned that explaining an incredible dish to someone is much easier when you can show it to them. For example, the Dark Side Chicken and Waffles at Backlot Express are cool with Darth Vader’s imprint on the waffles. Or maybe you want to try the classic Hollywood Studios dessert known as the Grapefruit Cake from The Brown Derby restaurant. Try the incredible malts or shakes at 50’s Prime Time while sitting in one of the 50’s themed booths with the black and white TV behind you. Whatever your food or drink of choice may be – capture that memory in time with a photo. This may seem simple enough but can easily be forgotten when in a rush. Give your child a camera and you’ll likely be surprised at the end results. We like the simple disposable ones that seem much less common these days. They are especially fun because you just never know how the photo will turn out until you get them developed. Kids eat this up and seem to find memorable moments we would never think of! If you want to see your PhotoPass photos on a bigger screen than your phone while in the park, head over to the Dark Room located near the entrance of Hollywood Studios. This is a great place to take care of all your photo/camera needs. Look for a nice frame to pick up while you are there! What are some tips and tricks you may have to making the most of your Hollywood Studios photos? We’d love to hear from you!